Born at a very young age in the middle of Florida, Edward migrated to Atlanta in 1988 to fulfill his dream of having his dreams fulfilled. He stumbled across DramaTech in time for The Blue Hour, but they let him come back anyway. 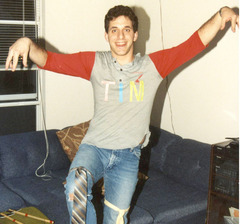 He attended a Halloween party as "Tie Knee Tim" (see attached picture), did some acting and backstaging and classes, and went about his humdrum life. Eventually, he met up with Karen Shields, who made an honest man out of him (but not before he was in Pajama Tops! ), and he moved away to California where he lives and works to this day.